Our ancestors have always honored the cycles of life. 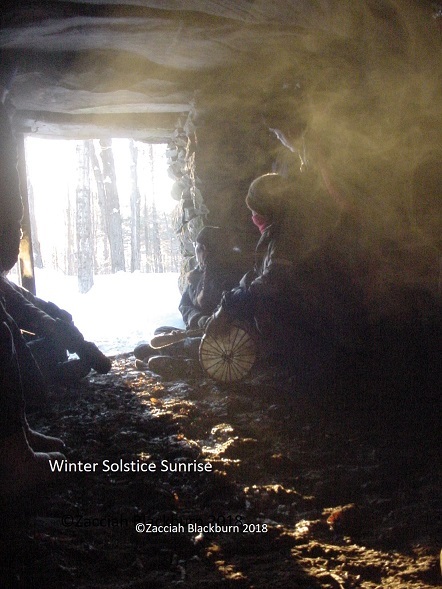 Winter Solstice sunrise, demarcating the lowest point the sun rises on the horizon annually, determined the mid-point of winter (thus mid-winter solstice,) as well as the mid-point of the year, back to mid-summer. The sun appears to stand still at that rising point for a few days (the meaning of the word ‘solstice,’ sun standing still.) They knew this was the turning point of light returning, ever so slowly, to the skies. Thus it was honored and celebrated as that time of light returning to our skies, yet, it equally was honored as the darkest time of year, the shadow time, the womb time, the Dream Time, and the time to easily enter the Dream (or subtle) worlds. It has been celebrated as the Feast of Dreams by indigenous peoples, for this very reason; it is the time to rest, nest, gather strength and vision, to peer into the inner worlds, the inner sanctuaries of darkness, the very womb of the Great Mother, and dream, vision, and prepare seeds for the coming year. Not just seeds of agriculture, but seeds of our own future wisdom, direction, guidance, action and growth. We nest with and gestate, cultivate these inner visions and seeds within us, in quiet times of inner reflection, vision, and connection with the more subtle realms. It is the time of looking within. When the light is not so bright in the room, it is a good time to turn inward and view the inner worlds, the subtle worlds, where that softer light can more readily be revealed, and seen. It is the time to consider our greater dream, purpose, vision, being, as well as connection to those who guide us. Let us welcome them in; the subtle guides and teachers of the other worlds, the worlds we do not so easily see. This is the time, in the darkness, that we can most easily see, meet, journey into, or invite and welcome those of those subtle worlds. Who are your guides and teachers? Invite and welcome them in. What do you wish to do with them, what wisdom or guidance do you wish them to reveal, or assist you with? Find time to be still, and ask the right questions. In many indigenous societies it marks the beginning of a new year. Our more modern calendar has turned that year away from a direct celebration of these long held and cherished cycles of Heaven and Earth. Some of us have forgotten their importance, and the benefit of working with the energetic realities of these cycles. May the Wisdom return. In celebrating the time of the light returning to the world, it has been honored as a time of the giving of that light to the world by the Divine. However you see and cherish this time, may it be a rich and fulfilling one for you and those you love. May you use it wisely. May it remind you of our connection to life, all life, and the cycles of life, of which we are a part. Your body knows these cycles, as its cells and memory remain intach with the cycles and knowing of the Earth and Sky. Take some time to turn within and imagine, discover, or re-invigorate your greater dream, and purpose in being here. Through that inner vision space, we all connect to the deeper realms of life and light, the web of life, the matrix of life. From there, we vision together and realize our part, and that we are a part, of that greater whole. We send our best wishes and blessings from our hearts to yours, through this day, through this season, and through these coming and changing times. And we pray you continue to learn, love, flourish, transform and grow. We pray you find your true essence and purpose, that your life can truly be one filled with joy and that you come into your own cycles of service within the nature and principles of Creation, however you define it. You can read about this spoken and sung prayer, and ideas of how you might use it to join with us or create your own prayers for the world. At the bottom of the article linked here, is the link to the player to listen to the mp4 file of the practice, as well as download it. We pray this will be of great benefit to you and others you may wish to share it with, and to this world of which we are a part. We all have a part to play in these times of profound transformation and growth. May we leaven, see, vision, and engage in our part now, if we have not already. For any summarizations or edits, please contact us for written permission.